Karonga is the most northerly town of any size in Malawi, close to the border with Tanzania. It sits on the shore of Lake Malawi (also known as Lake Nyasa). Other than the lake, its only attraction is the Culture and Museum Centre, containing a reconstructed Malawisaurus skeleton. 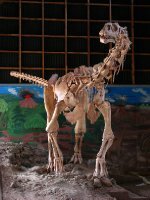 The Culture and Museum Centre (MK500 ticket) contains a reconstructed skeleton of Malawisaurus, a herbivorous dinosaur of the early Cretaceous period that was excavated nearby. More interesting are the exhibits chronicling the history of the region and its Ngonde people, in particular Karonga's beginnings as a base for Arab slavers. There are shared taxis to/from the border with Tanzania, taking about 45 minutes. There are several AXA buses per day between Karonga and Mzuzu, taking about 4.5 hours. Karonga is quite spread out but it is still small enough to negotiate on foot. There are internet cafés in the main cities and tourist locations. Skyband provide public WiFi hotspots around Airports, Restaurants, Hotels, Conference Areas, Cafe's, Sports Clubs, Bars, Pubs and General Public Areas.s. Credit is purchased with vouchers in denominations of 25MB, 50MB, 100MB, 200MB and 500MB at hotspot locations. The price is high when compared to a data bundle with a mobile provider. Malawi's country code is 265. The country's two man mobile gsm providers are Airtel and TNM. For 3G TNM has better coverage with Airtel only really covering the largest cities. Sim cards are available for 200 MWK. Malawi Posts provides services, that are affordable yet not very efficient or fast. Postcards will eventually arrive though. For parcels, it's better to use international courier services like DHL or FedEx. This is version 4. Last edited at 10:00 on Aug 12, 15 by Utrecht. 3 articles link to this page.